Partners is proud to host health summit events to build awareness and educate the communities we serve. Information and resources from previous summits and events are listed here for your reference. On April 6, 2018, Partners hosted Partners Health Summit: Treating the Opioid Crisis, its third summit focusing on opioid abuse and addiction. Nearly 430 behavioral health and social services professionals, expert presenters, and community leaders discussed how to fight the epidemic through prevention, education, and treatment and recovery. 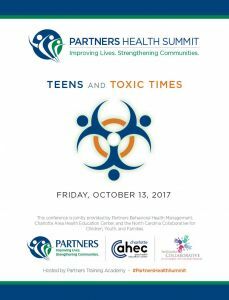 On October 13, 2017, over 500 people attended the Partners Health Summit: Teens & Toxic Times conference hosted and sponsored by Partners Behavioral Health Management. The one-day educational event was designed especially for professionals who work with teens. All of the keynote presentations and breakout sessions focused on interventions, resources, and solutions to help professionals work with adolescents and teenagers dealing with mental illness, substance use disorders, and other behavioral health issues. This conference was jointly provided by Partners Behavioral Health Management, Charlotte Area Health Education Center, and the North Carolina State Collaborative for Children, Youth, and Families. Drama in the trauma – Learn about the immediate and long-term effects of trauma, the impact trauma may have on brain development and behavior, and the best practice strategies for working with traumatized adolescents. Bio: Prior to joining Benchmarks, Mickle worked in various capacities with youth and other vulnerable populations, including uninsured rural populations, those in transitional living, adults and youth struggling with substance use illness, and teens suffering from behavioral health issues and difficult living situations. Self-Love – This session will define self-injury and identify the functions of self-injurious behavior. Learn about treatment considerations including dialectal behavior therapy, trauma-focused expressive art therapy, and other evidence-based treatments. Bio: Ferguson has served children and adolescents through the local Department of Social Services, public school systems, community-based service agencies, and private practice for 20 years. More than mood swings. This session will identify depression disorders in adolescents, discuss current psychopharmacological treatment, and suicidal behaviors. Bio: Dr. Munoz has more than 25 years of clinical experience in the diagnosis and treatment of psychiatric illnesses in adults and children. Just Say No – Explore the adolescent brain chemistry and identify the signs and symptoms of substance use among adolescents. What is Toxic Stress? Dr. Rintoul will explain how early stress and trauma can affect brain development and set the stage for health and development problems. Learn more about the Adverse Childhood Experiences (ACES) study and how stress changes stress response, memory, and attention to impulse control. Bio: Dr. Rintoul has special interest in infant/toddler mental health, parent-child interaction, early brain development, and prevention of child mistreatment. She has worked with children and families as a teacher, administrator, consultant, and therapist. Much of her work has involved culturally diverse clients and children at risk for developmental and/or mental health problems. Smartphones – They’re smarter than you think! Learn how smartphones and social media have become an adolescent addiction. Bio: Major Shores has served the Cleveland County Sheriff’s Office for over 26 years. He began teaching classes on sexting, cyberbullying, and human trafficking in 2015. He vs. She – Learn how to articulate appropriate terminology and what issues LGBTQ teens are facing. Bio: Greene is a transgender man and social worker passionate about supporting individuals who are struggling because of their identity, experiences, or beliefs. He practices from a trauma-informed, person-centered, and empowerment-based framework. Having trouble connecting? Learn new strategies for engaging teens who are hard-to-reach and the benefits of positive youth development. Bio: Rogers serves as the Youth Transition Director for North Carolina Families United in Graham, NC. His organization is recognized as the premier youth and family advocacy organization for the state of North Carolina. Bio: Testerman serves as the Executive Director for the Children’s Center of Surry, Inc. Her organization focuses on the prevention, intervention and treatment of child abuse and neglect serving Ashe, Forsyth, Stokes, Surry, Wilkes, & Yadkin counties. Explore how caring adult interaction can buffer the effects of toxic stress. Dr. Rintoul will present the components of protective relationships and ways to help teens develop emotional and behavioral self-regulations. 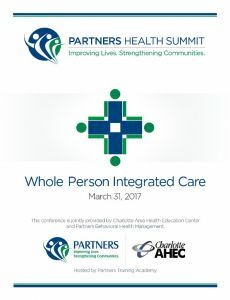 On March 31, 2017, Partners Behavioral Health Management and the Charlotte Area Health Education Center sponsored Partners Health Summit: Whole Person Integrated Care. Over 400 people attended the event to learn how the Whole Person Integrated Care model expands integrated care beyond the health care sector to include the social determinants of health, or the conditions in the places where people live, learn, work, and play. This summit featured nine presentations focused on an explanation and evaluation of the model, an exploration of the four causes of poor health, what it takes to build inclusive, resilient communities, and how to strengthen families and the social-emotional health of children. The event program and slide deck presentations are available through the tabs on the left. Description: Whole Person Integrated Care, or WPIC, is the integration of medical, behavioral, and public health approaches to care for the whole person. The WPIC model expands integrated care beyond the health care sector to include the social determinants of health, or the conditions in the places where people live, learn, work, and play. This session will help you understand how to incorporate the model for the organizations and communities you serve. Bio: Martha Kaufman, M.Ed., has focused on advances in behavioral health care throughout her career. Currently, she is responsible for developing Partners’ Whole Person Integrated Care initiative. Martha has worked with a number of LME-MCOs and health departments across the state, focusing on care systems that build partnerships to better serve individuals. Prior to her role at Partners, Martha worked at the NC Division of Mental Health, Developmental Disabilities, and Substance Abuse Services as State Project Manager for North Carolina’s first three SAMHSA-funded System of Care grants, and served as director of North Carolina’s Child and Family Mental Health Services. She has worked in a variety of other communities and states to help improve life outcomes for children and their families. Martha holds an M.Ed. in Counseling Psychology from Auburn University, with undergraduate work at Auburn and the University of Idaho. Description: The presentation will examine how four factors of poor health (tobacco, alcohol, diet and exercise) impact on mental health as well as physical health and the reasons they are a concern for all clinicians. The importance of brief assessments and monitoring will be discussed. Brief and effective interventions will outline actions that can be a part of any clinical appointment. Bio: Michael Clark, MD, is a psychiatrist and has over twenty years of experience in the mental health field, is board-certified in both Psychiatry and Child and Adolescent Psychiatry, and is a member of the American Academy of Child and Adolescent Psychiatry. He received his medical degree from Texas A & M University and completed a psychiatry residency and child psychiatry fellowship at the University of North Carolina at Chapel Hill. At Partners, he focuses on utilization of services, and is involved with the development of integrated care within our communities. Dr. Clark is also very involved with Partners’ work to eradicate the opioid epidemic by educating others about addiction. How Ready is Your Family? Description: An overview of an integrated evaluation model that includes developmental, systems-based, collaborative, outcome and implementation evaluation will be presented with emphasis on structuring the evaluation for rapid detection and response to trends and emerging issues. Staff training, data collection methods, and reporting will be emphasized. Bio: Dr. Walby’s career has spanned clinical practice, research, evaluation, community network improvement, and resource and sustainability development. He has focused on the enhancement and application of systems-based intervention and evaluation for much of his career. As a clinician, he specialized in working with families at risk and adults with severe mental illness, using systemic family therapy and other systems based models. As an evaluator, he ensures that all evaluations, simple to intricate, are contextually relevant and applies systems and complexity models to enhance findings and to develop sustainability for the client. Dr. Walby received his Bachelor Degree from Michigan State University with a dual major in Psychology and Criminal Justice. He completed a Master’s of Science in Psychology from Nova University, a Masters of Public Health in Epidemiology and Doctorate in Public Health from the University of South Florida. Description: All humans depend upon their organic relationships with other people and with their environment. Some also use formal services, and paid support staff. This session will describe many types of natural supports that complement formal services, or can substitute to a certain degree for services unable to be accessed due to waiting lists, eligibility or finances. In addition to descriptions and many real examples of people helped through natural supports, a case will be made for how this also creates more inclusive and open-minded communities, thus overall reducing loneliness and isolation. The types of natural supports explored will include time banking, personal support networks, creative technology applications, and supported decision-making. Bio: Betsy MacMichael, Executor Director of First In Families of NC, has worked in the field of Intellectual/Developmental Disabilities to promote self-determination, inclusion and positive community awareness of families and family support needs for the past 19 years in NC, in both service and policy contexts. First In Families complements the formal service system to meet the various and changing needs of families and individuals with disabilities, especially those without formal services. Since 2005, Betsy’s work has emphasized the crucial need for future planning and how to make it more accessible to families. Through both First In Families, and her personal involvement with people with disabilities, she has implemented the use of Personal Networks, Time Banking, supported decision-making, and whole family support. Description: This presentation will describe the role of individual, family, and community resiliency as health and wellness drivers, and suggest practical techniques for infusing a resiliency orientation in both the normal course of patient interactions and also in the internal culture of a health care organization dedicated to delivering Whole Person Integrated Care. Bio: John Franz has advanced degrees in law and educational psychology and has worked as a teacher and a child and family advocate for more than four decades. He has worked with communities, agencies, and tribal governments throughout the United States in their efforts to develop more integrated, effective, and people-focused systems of care. Mr. Franz has represented children and families in class action lawsuits to obtain proper services and benefits and authored legislation and administrative rules for child welfare and child and adult mental health services. He is known for developing collaborative and creative solutions when children and families have complex needs across multiple life domains. Description:Burke Integrated Health is the first Whole Person Integrated Care facility in North Carolina to utilize peer support in an integrated setting of Primary Care, Substance Abuse, and Mental Health services for children and adults. This resulted in mobilizing an integrated peer support force to navigate peers through all systems of care with ease.A peer support specialist (e.g., certified peer support specialist, peer provider, recovery coach, or integrated care life recovery coach) is a person who uses his or her lived experience of recovery from mental illness and/or addiction, plus skills learned in formal training, to deliver services in healthcare settings to promote mind-body recovery and resiliency.Peer support specialists share their own experiences giving the power of hope no matter what the struggle happens to be by providing the options and resources needed to succeed in life. They work directly with peers to encourage and empower them. Bio: Joshua Singleton currently serves as an Integrated Health “Life Recovery Coach” at A Caring Alternative and Burke Integrated Health in Morganton NC. He has 10 years of personal and professional experience with MH/SA Whole Person Integrated Care. He is a Certified Peer Support Specialist, Duke University Certified Non-Profit Manger, Copeland Certified Wellness Recovery Action Plan Facilitator, NC Registered Certified Substance Abuse Counselor, and Certified Assemblies of God Minister. Joshua serves in the Non-Profit sector for A Caring Solutions, The House of Refuge, Frontier Bible College, and Lenoir for Christ Church. Additionally He has served as UNC Chapel High Fidelity ACTT Peer Trainor, ACA CPSS ACTT Team, Celebrate Recovery State Rep, and Celebrate Recovery Ministry Leader. Bio: John Weeks currently serves in the B3 Peer Support Services unit for A Caring Alternative. He has been in recovery for 10 years and certified as a peer support specialist since 2010. John is the vice president of the South Mountains National Alliance on Mental Illness affiliate. Previously, he worked as an Assertive Community Treatment team peer support specialist for RHA. John conducts training sessions about Wellness Recovery Action Plans, Adult Mental Health First Aid, and Youth Mental Health First Aid. He has earned three Associate of Science degrees in Computer Electronics from Florida Technical College, Computer Programming and Analysis from Valencia Community College, and Building Construction Technology from Isothermal Community College. Description: This presentation will stretch the thinking of the application of “public health” approaches to enable stronger families and healthier children. Specifically, the focus will be on the application of public health approaches to create a positive impact on the social determinants of health and the prevention of adverse childhood experiences. Triple P – the Positive Parenting Program – will be highlighted as one example of how a public health approach can be applied to address social determinants of health. Moreover, case studies, including examples from North Carolina, will be used to illustrate concrete examples of how Triple P has resulted in public health outcomes. Bio: Sara van Driel is an advocate for helping to build communities that support families in giving their children the best opportunity to achieve their potential. Sara has her doctorate in Clinical-Community Psychology and has worked to support children, families, and communities for over 15 years. She completed her clinical internship here in North Carolina at Duke Medical Center and currently helps to support implementation of Triple P – Positive Parenting Program – in over a third of the United States including North Carolina. Sara currently serves as an Implementation Consultant for Triple P America, where she works with communities across the US to help in the planning of effective implementation of Triple P. Sara’s previous experience spans research, clinical practice, and training. 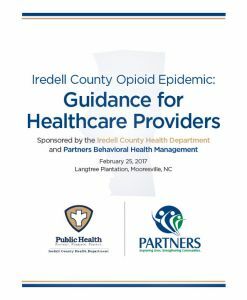 On February 25, 2017, Partners Behavioral Health Management and the Iredell County Public Health Department co-sponsored an educational event for healthcare professionals in Iredell County. The purpose of the event was to provide a better understanding of the science of addiction and self-destructive behavior, naloxone and the NC Standing Order, safe opioid prescribing, and the NC Controlled Substance Reporting System. This event was also sponsored by the North Carolina Governors Institute and a byproduct of strategic planning efforts steered by the Drug Abuse Free Iredell Coalition. The event program and slide deck presentations are available through the tabs on the left. 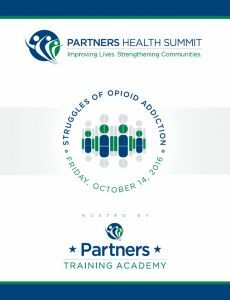 Almost 400 citizens learned ways to combat the largest drug epidemic plaguing our country—opioid and prescription drug overuse—during the most recent Partners Health Summit, the Struggles of Opioid Addiction, on Friday, October 14. The summit brought the general public and addiction and recovery specialists together to explore addiction and understand prevention, treatment, and recovery for those living with addiction. The free summit offered nine presentations focused on treating chronic pain without opioids, how legislation impacts the epidemic, treatments for addiction, teens and addiction prevention, and how to care for those in recovery. Participants were also able to connect with support professionals from the area and join the Recovery Rally to celebrate the hard work and dedication needed to sustain recovery. Presenter: Jason Winkler, Substance Abuse Intensive Outpatient Therapist for Support, Inc.
Join in a celebration of the hard work and dedication needed for people to recover from opioid addiction and other substance use disorders. The rally will include inspirational speakers, personal recovery stories, music, and refreshments for all attendees. Over 18,000 people have died from an overdose of prescription opioids in the United States in the past year. The prescription of, and the misuse and addiction to these drugs have surpassed marijuana and are decimating a generation of Americans. Heroin use and overdoses deaths are on the rise as well. This epidemic was born in another epidemic: Chronic Pain. This session will review how we got to this point, the nature of the epidemic, pain treatment and addiction, and will explore solutions for changing course at this crucial time. Presenter: Mel Pohl, MD, DFASAM is the Chief Medical Officer of the Las Vegas Recovery Center (LVRC). Dr. Pohl was a major force in developing LVRC’s Chronic Pain Recovery Program. He is a Board Certified Family Practitioner, certified by the American Board of Addiction Medicine, and a Distinguished Fellow of the American Society of Addiction Medicine. Dr. Pohl is a Clinical Assistant Professor in the Department of Psychiatry and Behavioral Sciences at the University of Nevada School of Medicine. He was elected by his peers for inclusion in Best Doctors in America® from 2009 to present. He is the author of A Day Without Pain (Central Recovery Press) and The Pain Antidote – Stop Suffering from Chronic Pain, Avoid Addiction to Painkillers, and Reclaim Your Life with Kathy Ketcham (DaCapo Press). This interactive presentation will focus on prevention basics and how prevention is disseminated. Basics include the Center for Substance Abuse Prevention’s Six Prevention Strategies, the Strategic Prevention Framework, and Protective factors. The presentation concludes with individuals in recovery, Iain Wisdom and Janis Dawson, who will share stories about their addictions. Presenter: Maceo Mayo III, CSAC, Certified Substance Abuse Prevention Consultant, Certified Peer Support Specialist, and Prevention Services Coordinator with RHA-Addiction Recovery and Prevention in Gaston County. Mr. Mayo has a Bachelor of Arts in Sociology and is currently pursuing a Master of Arts degree in Human Services Counseling at Liberty University in Lynchburg, VA. He is a Certified Substance Abuse Prevention Consultant, a registered Certified Substance Abuse Counselor and a Certified Peer Support Specialist in the state of North Carolina. He is the former Prevention Director for Freedom House of Mecklenburg, Inc. and Executive Director of Power of Prevention Inc., and Substance Abuse Prevention Specialist for Family Innovations, LLC. Mr. Mayo has been a consultant for HUD’s Drug Elimination Technical Assistance Program since 1997. He has provided technical assistance for various public housing authorities and resident groups within the United States for 33 years. His areas of expertise include leadership training, community organization and development, neighborhood association building, creative problem solving, diversity, drug information, and advocacy. Presenter: Andrea Garraway, Partnership For Success (PFS) Grant Coordinator and Prevention Specialist with Addiction, Recovery, and Prevention located in Gastonia, NC. Ms. Garraway holds a masters in Mental Health/Counseling Psychology from Bowie State University in Bowie, MD. She is an Associate Licensed Clinical Addictions Specialist, an Associate Licensed Professional Counselor, and is a Registered Certified Substance Abuse Prevention Consultant. She provides management support and coordination for the PFS grant. The grant seeks to reduce the negative effects of prescription drug misuse and abuse in North Carolina through the implementation of the Strategic Prevention Framework. During her six years working in prevention, Andrea coordinated and facilitated an array of various prevention programs for non-for-profit to the public sector. She has also contributed articles to Gaston Gazette, HOLA Noticias, and Que pasa mi Gente publications. Learn about the many facets of helping someone with an addiction. Topics include encouragement/enablement versus empowerment, patience, accountability, true accounts of the risks of enmeshment (co-dependence), commitment with boundaries, and research and statistics from the national and state levels. Presenter: Jason Winkler, LPCA, LCASA, Substance Abuse Intensive Outpatient Program Treatment Clinician with Support, Inc. Mr. Winkler graduated from Lee University in Charlotte, NC, with a Bachelor of Science in Pastoral Counseling. He received a Master of Arts in Clinical Mental Health from Lenoir-Rhyne University in Hickory, NC. Mr. Winkler is a Licensed Clinical Abuse Specialist Associate (LCASA), with previous experience being a program manager at a Psychosocial Rehabilitation Center, a psychotherapist at a private practice, and a Therapist at a Behavioral Health Hospital in their Partial Hospitalization Program. He has worked with individuals of all ages with various mental health diagnoses. Currently working as a therapist for the Substance Abuse Intensive Outpatient program on Chestnut Street in Gastonia site, he provides both basic drug education, Intensive group therapy, case management services to facilitate long-term, successful recovery and growth for his clients. During this session, you will learn about the levels of care available for people with addiction and substance use disorders, plus the services offered by providers in Burke, Catawba, Cleveland, Gaston, Iredell, Lincoln, Surry and Yadkin counties. The presenters will provide a snapshot of a client that would be appropriate for each level of care and service. Presenter: Lynne Grey, MA, LPC, LCAS, CSI, Mental Health/Substance Use Disorder Utilization Management Supervisor with Partners Behavioral Health Management. Ms. Grey received a Bachelor of Arts in Psychology from the University of North Carolina at Chapel Hill in Chapel Hill, NC and a Master of Arts in Community Counseling and a Graduate Certificate in Addictions Counseling from Appalachian State University in Boone, NC. Her professional experience includes providing individual, group, and family therapy for adolescents and adults diagnosed with substance use disorders. Before coming to Partners, Lynne managed the Substance Abuse Intensive Outpatient Program and Substance Abuse Comprehensive Outpatient Treatment programs at an agency in Gastonia. Presenter: Michael Clark, MD, Associate Medical Director with Partners Behavioral Health Management. Being board-certified in both Psychiatry and Child & Adolescent Psychiatry, Dr. Clark is qualified to deliver care and consultation across the age range. Since completing a psychiatry residence at The University of Texas Health Science Center at San Antonio and a child psychiatry fellowship at the University of North Carolina at Chapel Hill School of Medicine, he has gained broad experience over twenty years in the field of mental health. Initially, Dr. Clark entered the private sector and delivered outpatient and inpatient care in a managed care setting. During that time, he was medical director over an adolescent psychiatric unit at Alamance Regional Medical Center. In 1999, he began work full-time in the public sector with The Guilford Center and eventually became medical director. At the Guilford Center, he also working to assure patient needs were met in the appropriate level of care in their outpatient clinics and in their crisis/emergency unit. Dr. Clark is also a member of the American Academy of Child and Adolescent Psychiatry. What is normal? It’s a setting on an appliance, not a label that can be applied to people. In this session, learn about the effects of living with addiction, how to recover, and the difference between dysfunctional and functional families. Presenter: Georgeina Koontz, Clinical Manager-Shelby Outpatient Program, with Phoenix Counseling Center. Ms. Koontz received a Bachelor of Arts in Psychology, with a specialty in substance abuse, from Penn State University, PA in 1993. She also received Master of Arts and Specialist of Education degree in mental health counseling from Gardner-Webb University in Boiling Springs, NC in 2007. She became a Certified Substance Abuse Counselor in 1998, a Licensed Clinical Addictions Specialist in 2009, and a Certified Clinical Supervisor in 2014. Ms. Koontz has been working in substance abuse field since 1993 serving adults, adolescents, men only, women only, those with dual diagnosis, and families in therapy in areas such as detox/crisis, outpatient, DWI, residential treatment-short and long term, transitional living, prison, probation, and parole population, and clinical supervision. The presentation will provide a brief overview of medication-assisted treatment, particularly methadone and buprenorphine. There will be a basic explanation of the pharmacology of these medications. The presentation includes a specific example of medication-assisted treatment at the McLeod Center. Typical myths, stigmas, and attitudes associated with medication-assisted treatment, and the truths about this treatment, will be addressed. Presenter: Christie Simons, Director of Counseling Services and Psychology Professor with Belmont Abbey College. Ms. Simons recently transitioned from Program Manager at the McLeod Center to her new position as a director and professor at her alma mater, Belmont Abbey College. She received a Bachelor of Arts in Psychology and Theology from Belmont Abbey College in Belmont, NC and received a master’s in Marriage and Family Therapy from Richmont Graduate University in Atlanta, GA. During a graduate internship, she worked with the Dual Diagnosis population. Upon completing graduate studies, Ms. .Simons returned to Belmont Abbey as an adjunct professor in the Psychology Department, teaching courses such as Psychology of Addictions, Abnormal Psychology, and Developmental Psychology. She then worked as a counselor, and later program manager, at the McLeod Center with medication-assisted treatment where she attended numerous trainings on medication-assisted treatment and pharmacology. Hear about combining resources and services to build a community ensuring a system of whole person care. The presentation includes a brief correlation between mental health disorders and substance use disorders. There will also be an overview of current area mental health and substance use providers with current services offered, and the current gaps in services regarding the Dual Diagnosis population in relation to current provider services. Finally, the presentation reviews Recovery-Oriented Systems of Care in relation to values and operational elements. Presenter: Heather Lail, MA, LCAS, CSI, Director of Clinical Services with Clay, Wilson & Associates-The Cognitive Connection. Ms. Lail is a native of Catawba County. She completed her undergraduate degree in Psychology from Lenoir-Rhyne University in Hickory, NC and completed her graduate degree in Professional Counseling from Liberty University in Lynchburg, VA. She has worked in the behavioral health field for 13 years in positions including case management, direct care, lead clinician, community outreach supervisor, LCAS site supervisor, and all aspects of outpatient substance use treatment. Join in a celebration of the hard work and dedication needed for people to recover from opioid addiction and other substance use disorders. We will celebrate recovery in a safe environment together. The rally will include inspirational speakers, personal recovery stories, music, and refreshments. Presenter: Cornelia Pringle has over 27 years of experience in the field of addiction and mental health. She holds a Master’s Degree (MS) in Substance Abuse & Education, Licensed Professional Counselor Associate (LPCA), Licensed Clinical Addiction Specialist (LCAS), Masters Addiction Counselor (MAC), Certified Clinical Supervisor (CCS), Internationally Certified Advanced Alcohol & Drug Counselor (ICAADC), and Internationally Certified Clinical Supervisor (ICCS). Cornelia has specifically worked with individuals and groups dealing with substance abuse, co-occurrence disorders, trauma, and criminal behaviors. She is currently working as a program manager in Charlotte, NC where she is supervising several treatment program modalities such as Substance Abuse Intensive Outpatient Treatment Program (SAIOP), Substance Abuse Comprehensive Outpatient Treatment Program (SACOT), and Aftercare. Cornelia’s goal is to successfully collaborate with other community resources in order to be able to serve women who are transitioning from the criminal justice system. The name of her transitional living facility is named “W.I.N.G.S”, which stands for Women In Need of Greater Support. Recovery has afforded her a chance to make a difference in her life and she want to offer the same opportunity to others. 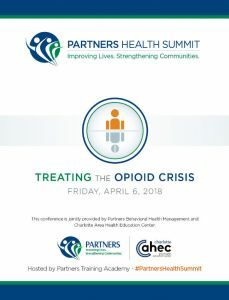 On Friday, March 11, Partners Behavioral Health Management and the NC Council of Community Programs tackled North Carolina’s opioid epidemic by training 400 local doctors, healthcare providers, first responders, law enforcement officers, parole officers and county health department personnel at its first-ever Opioid Summit. 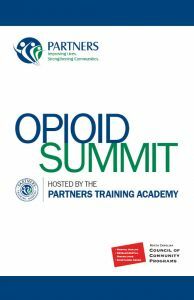 The free summit offered 17 presentations focused on early identification of substance use disorders, overdose reversal strategies, medication-assisted treatment procedures, alternative pain management options, and the latest best practices in the prescribing of opioids. See the line-up of presentations held on March 11, 2016. Presenter: Sarah Potter is the Chief of Community Wellness, Prevention, and Health Integration at the North Carolina Department of Health and Human Services, Division of Mental Health, Developmental Disabilities, and Substance Abuse Services. She previously served as the Director of Health Policy and Program Development for the Illinois Alcoholism and Drug Dependence Association where she led statewide behavioral health and health policy efforts. In that role, she also directed a state wide substance abuse prevention and leadership development program for high school and middle school youth. Her career reflects an ongoing commitment to helping people live healthy, productive lives and building behavioral health system capacity. First Session Options – 9:00-10:15 a.m.
Motivational Interviewing (MI) is a goal-directed, client-centered counselingstyle for eliciting behavioral change by helping patients to explore and resolve ambivalence. The operational assumption in MI is that ambivalent attitudes or lackof resolve is the primary obstacle to behavioral change, so that the examinationand resolution of ambivalence becomes its key goal. MI has been applied to a widerange of problem behaviors related to alcohol and substance abuse as well as healthpromotion, medical treatment adherence, and mental health issues. Learners willreview and practice the skills of MI and how to use it to assess and engage patientsthat may have Substance Use Disorders in health care settings. Medicated assisted treatment (MAT) for opioid addiction may be providedin an OTP or an OTP medication unit (e.g., pharmacy, physician’s office) or,for buprenorphine, a physician’s office or other health care setting. Physicians working in medical offices or other appropriate settings must obtain a waiver from SAMHSA to use buprenorphine to treat opioid addiction. The most frequently used medication for opioid addiction treatment in OTPs is methadone. This presentation will share a whirlwind overview of buprenorphine in both the private practice as well as in Opioid treatment facilities. The pros and cons of MAT, course of treatment, along with use of Evzio use for overdose protocol will be addressed. This session will review the fundamentals of pain and suffering, in terms of howto differentiate between acute pain and chronic pain, as well as exploring the neurobiology of pain. The epidemiology of the opioid epidemic will be discussed in context of the nature of opioid prescribing practices. In addition, medications thatare used to treat chronic pain will be reviewed including non-opioid medications, as well as screening, entry, and exit strategies of rational prescribing. Presenter: Mel Pohl. M.D., FASAM, is a Board Certified Family Practitioner. He is Vice President of Medical Affairs and the Medical Director of Las Vegas Recovery Center. Certified by ASAM, Diplomate of the American Board of Addiction Medicine, Diplomate and Fellow of the American Board of Family Practice. He is anationally known public speaker and co-author of Pain Recovery: How to Find Balanceand Reduce Suffering from Chronic Pain along with other books. His newest bookis with Kathy Ketcham, The Pain Antidote, Stop Suffering from Chronic Pain, Avoid Addiction to Painkillers, and Reclaim Your Life, currently available at bookstores. This session will highlight opportunities for law enforcement to help address the Opioid epidemic, with a focus on Law Enforcement Assisted Diversion (LEAD).LEAD is a pre-booking diversion program developed with the community toaddress low-level drug crimes. The program allows police and sheriffs to redirectlow-level offenders to community-based programs and services, instead of jail andprosecution. By diverting eligible individuals to services, LEAD is committed to improving public safety and public order, and reducing the criminal behavior of people who participate in the program. Presenter: Donnie Varnell leads NC Harm Reduction Coalition’s Law Enforcement Assisted Diversion (LEAD) program and law enforcement trainings and organizing program for NC Harm Reduction. Prior to working for NCHRC, Donnie was the Special Agent In-Charge for the NC State Bureau of Investigation’s Diversion and Environmental Crimes Unit (DECU) where he developed policies, conducted andsupervised investigations dealing with prescription narcotics and environmental violations. He was with the SBI from 1991 through 2015. Donnie received his BS inCriminal Justice from Texas State University in 1985. This session will review alternative strategies for pain management including mindfulness, cognitive behavioral techniques, nutrition, meditation, exercise, support groups and medical procedures. The focus will be on treatment options useful for successful management of chronic pain and for use with patients inrecovery from Substance Use Disorders. Presenter: Dr. Kashyap Patel, M.D., Board Certified Holistic and IntegrativeMedicine, Medical Oncology, Hematology, and Internal Medicine. Second Session Options – 10:30-11:45 a.m.
An explanation of Medication Assisted Treatment specific to Opioid Use Disorders. This session includes a review of current best practices in matching individualized outpatient care to the unique needs of the individual. There will be a discussion of Ambulatory Detoxification, Opioid Treatment Services, and an Integrated Caremodel. Presenter: Dr. Bobby Kearney, MD, Director of Medical Services at Addiction Recovery Medical Services. (A.R.M.S) in Statesville, NC. Dr. Kearney is Board Certified by the American Board of Addiction Medicine, the American Board ofPain Medicine, and the American Board of Anesthesiology. 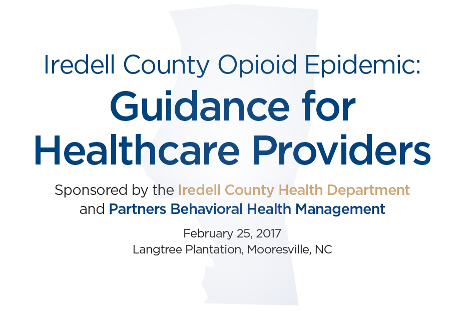 Attendees will be trained in how to use naloxone, a medication that reverses opioid overdoses, and learn about the Good Samaritan Law in NC. Presenter: Hyun Namkoong, MGH, MPH has been a Health Journalist for NC Health News as well as a Strategic Communications Writer for the UNC Gillings School of Public Health. She has written and contributed to numerous publications on the topics of rural health health disparities, adolescent health, health research, health policy, and health innovations. The Strategic Prevention Framework-Partnership for Success Grant (SPF-PFS) is designed to address one of the nation’s top substance abuse prevention priorities: prescription drug misuse and abuse among persons aged 12 to 25. The program is based on the premise that changes at the community level will, over time, lead to measurable changes at the state level. Prevention is a proactive process that seeks to intervene prior to the need for treatment services. This breakout session will focus on the counties receiving the PFS Grant in Partners Behavioral Health Managements catchment area. Each of the recipients will share what they have accomplished and what they plan to accomplish. You will have an opportunity to ask questions and share your thoughts as well. The Substance Treatment And Referral (STAR) Program began with an idea in2012 and has evolved into a critical community initiative to more comprehensively outreach and serve pregnant women with Opioid Addiction. This session will describe the medical home model and clinical pathways maximizing active treatment of the Substance Use Disorder over the course of pregnancy through collaboration with responsive community providers. A needs assessmentand thorough problem analysis resulted in the addition of peer support and transportation as critical components to a successful program. Presenter: Dr. Velma V. Taormina and other members of the Gaston CountySTAR Program. 11. Keynote Presentation: Why Integrate Addiction Care into Mainstream Medicine? This keynote session will provide an explanation of Medication Assisted Treatment specific to Opioid Use Disorders. It will also provide a review of current best practices in matching individualized outpatient care to the unique needs of the individual, as well as a discussion of Ambulatory Detoxification, Opioid Treatment Services, and an Integrated Care Model. Dr. Thomas McLellan is the co-founder and Chairman of the Board of Directors at the Treatment Research Institute. He was the principal developer of the Addiction Severity Index (ASI) and the Treatment Services Review, widely used substance abuse instruments. He has served as an advisor to many government and nonprofit scientific organizations, including the Office of National Drug Control Policy, the National Practice Laboratory of the American Psychiatric Association, the Swiss National Science Foundation, the World Health Organization, the Greek government and Public Health England. Additionally, Dr. McLellan has published over 400 articles and chapters on addiction research, and is the recipient of the distinguished Life Achievement Awards of the American and British Societies of Addiction Medicine. Third Session Options – 1:45-3:00 p.m. Chronic Pain occurs as a complicated web of emotions and physical symptoms.The most common way to treat pain is to use opioid medications, which actually complicate the course of chronic pain. For some individuals who develop chemical dependency in addition to these medications, management and treatment for their condition can become much more complicated. This session will review the interactions of pain, suffering, and addiction as they interface in your clients with suggestions for intervention and treatment. North Carolina Harm Reduction Coalition staff will explain the coalitions naloxone distribution model and success in passing out overdose rescue kits and tracking reversals. Presenter: Hyun Namkoong, MGH, MPH has been a Health Journalist for NCHealth News as well as a Strategic Communications Writer for the UNC Gillings School of Public Health. She has written and contributed to numerous publicationson the topics of rural health, health disparities, adolescent health, health research, health policy, and health innovations. The Strategic Prevention Framework-Partnership for Success Grant (SPF-PFS) isdesigned to address one of the nation’s top substance abuse prevention priorities:prescription drug misuse and abuse among persons aged 12 to 25. The program isbased on the premise that changes at the community level will, over time, lead to measurable changes at the state level. Prevention is a proactive process that seeks to intervene prior to the need for treatment services. This breakout session will focuson the counties receiving the PFS Grant in Partners Behavioral Health Management catchment area. Each of the recipients will share what they have accomplished and what they plan to accomplish. You will have an opportunity to ask questions and share your thoughts as well. Discussion topics will include promoting engagement, matching clients with the appropriate levels of care, promoting positive treatment outcomes, coordination of care across providers and services, and successful discharge/transition planning. The panel will include representatives from primary care, Opioid Treatment Services (“methadone clinic”), Medication Assisted Treatment, and Substance Use Disorder specialty services (IOP, Comprehensive Outpatient, and halfway houseservices). The providers participating will be McLeod Center, Phoenix Counseling Center, Psychiatric Services of the Carolinas, and Rudisill Family Practice. These agencies provide a range of services treating Opioid Use Disorders and have been actively involved in a SUD Collaborative over the past year to improve communication and functioning of the Partners Behavioral Health Management continuum of care. Facilitator: Lynne Grey, MA, LPC, LCAS, CSI is currently working as an MH/SUDUtilization Management Supervisor at Partners Behavioral Health Management. She received a BA in Psychology from the University of North Carolina at Chapel Hill and an MA in Community Counseling from Appalachian State University, along with a Graduate Certificate in Addictions Counseling. Her professional experience includes providing individual, group, and family therapy for adolescents and adults diagnosed with substance use disorders. Before coming to Partners, Lynne managed the Substance Abuse Intensive Outpatient Program(SAIOP) and Substance Abuse Comprehensive Outpatient Treatment (SACOT) programs at a local agency in Gastonia. The early detection of substance use and mental health disorders often resultsin interventions that are less intensive than when detected late. Integrated and coordinated care in general healthcare improves the likelihood of early detectionthrough screening and assessment and provides the ability to coordinate anyinterventions with other team-based healthcare providers. Attendees will explorethe screening tools and best practice in integrated care to achieve the greatest impact with the lowest cost. Presenter: David Swann, LCAS, CCS, LPC, NCC, Senior Consultant with MTM Services and National Council for Community Healthcare. Mr. Swann is aLicensed Clinical Addictions Specialist, Certified Clinical Supervisor, Licensed Professional Counselor, and is a National Board Certified Counselor. He also serves on numerous national, state and local boards whose programs are designed to deliver high quality health and behavioral healthcare. He is the co-author of Operationalizing Healthcare Reform published by the National Council for Behavioral Healthcare in April 2013. Most recently, David Swann’s work has been highlighted in the manual The Integration of a Mental Health Professional into the Primary Care Setting: A Manual For Pediatric Providers (2009), and the Open Minds Industry Feature: A Commitment to Make A Difference – Mental Health Reform in North Carolina (2007). Fourth Session – 3:15-4:30 p.m. The closing session will feature individuals with lived experience in both addiction and long-term recovery. Through sharing of their unique personal journeys, we hope to remind attendees of the diversity of individuals impacted by this epidemic, inspire hope, and build awareness of Recovery Oriented Systems of Care. All three panelists entered the workforce to help others recover. They offer great feedback and insights into how the treatment system can be improved.